While a highly qualified teacher in every classroom is an entitlement for every child, as well as a cornerstone of “No Child Left Behind”, this essential educational goal has been set in the midst of a nationwide teacher shortage, which is exacerbated in our nation’s urban schools, as teachers leave these schools at a 30% higher rate (Ingersoll, 2001). The high teacher turnover rate contributes to a loss of cohesiveness, continuity and community that are essential to high performing schools (National Commission on Teaching for America’s Future, 2003). It also negatively impacts the quality of teaching, as individuals do not stay in the profession long enough to develop the skills and dispositions required to become expert teachers. There is a growing body of evidence indicating a direct relationship between teacher quality and student achievement (Darling-Hammond, 2001). In addition to human capital, it is estimated that $7.34 Billion dollars are spent in the U. S. to hire, recruit, and train teachers to replace those who retire, change schools, and leave the profession (Barnes, Crowe, and Schaefer, 2007). Within the past few years, much attention has been given to induction programs that make extensive use of assigning experienced teachers to mentoring new teachers. Smith and Ingersoll (2004) and others have reported the positive impact that comprehensive induction programs can have on lowering teacher turnover rates. The internship program is based on a partnership between a university and six urban area school districts. Unlike other teacher internship programs described in the professional literature describing various means of sharing classroom responsibilities with other interns or mentor teachers, the interns in our program serve as the teacher of record, while they assume full teaching responsibilities, and earn approximately 80% of a first year teacher salary. Each intern received intensive support from varied sources. They became a member of a cohort group of 5-6 interns, with an assigned full-time mentor who was a teacher with a Master’s degree, and 5 years of experience. The interns were also members of an electronic learning community that participated in university facilitated video-conferences and Blackboard-vista discussions. The interns manifested significant increases in their self perceived levels of readiness, self-efficacy, and confidence as a teacher. The interns were also assessed by school administrators using the Professional Development and Assessment System (PDAS), a state endorsed instrument. 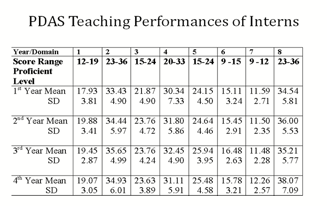 Overall, the group of interns was ranked high within the proficient range in each of eight major teaching domains. The results are summarized in the table below. The intern turnover rates were lower than the teacher turnover rates for the schools in which they completed their internship. For the first year of the internship program, for example 84% of the interns returned to their schools to teach for their second year. During this same time, 65% of the teachers in these schools returned to teach in these schools the next year. Barnes, G., Crowe, E., & Schaefer, B. (2007). The cost of teacher turnover in five school　districts. Washington, DC: National Commission on Teaching and America’s Future. Darling-Hammond, L. (2001). The challenge of staffing our schools. Educational Leadership,58(8), 12–17. American Educational Research Journal, 38, 499-534. National Commission on Teaching for America's Future, (2003). No dream denied: A pledge to America’s children. Washington, DC: NCTAF. Smith, T. & Ingersoll, R. (2004). What are the effects of induction and mentoring on beginning teacher turnover? American Educational Research Journal,41(3), 681-714.